*I'm pretty excited for this book and I've read some great reviews. I think it would not only be a great read that I'd enjoy, but also one that is informative for my students. I am definitely looking forward to its publication. I remember seeing great reviews on this one too! I got this one pre-order only another month, I am excited. "a moving story of country, culture, family, and the true meaning of home"....love it. Great pick! This sounds very moving and powerful, great pick! This one I need to read. Last year I did a essay about Fidel Castro and I want to read this very bad. Love the cover of the book too. This sounds like a great read! This is the first I have heard of it. I will be putting it on my wish list. I had never heard of Operation Pedro Pan so I am interested in learning more about it. I love the trailer! I might read this book for the POC challenge. Great pick and welcome back! 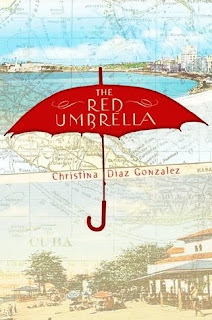 The Red Umbrella looks like a fantastic book. I will be adding this to my TBR list. Thanks for all the comments! I hope you have a great week.